You can spend many hours browsing round the old Ordnance Survey maps of London and elsewhere that the National Library of Scotland has made available, free of charge. A feature of the 1893 map is that it includes some archaeological information, along with contemporary street plans. 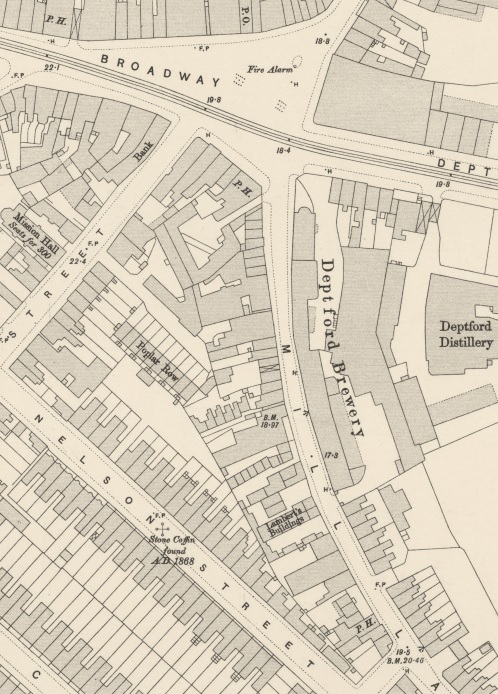 According to this map, a stone coffin was found in Deptford's Nelson Street, now Vanguard Street, in 1868. 'The line of Roman Watling Street, the road from Dover to London, is believed to have crossed the River Ravensbourne at Deptford and then followed the modern Deptford Broadway... The Dover Castle Inn excavations found evidence for Roman occupation on the north side of Deptford Broadway... A Roman building with a tesselated floor was found near the corner of Deptford Broadway and Deptford High Street during sewerage work in 1886... A probable Roman stone coffin was found in Vanguard Street, south of Deptford Broadway.. in 1868'. Yesterday morning, in carrying out the local main drainage works in Nelson Street, Deptford, the men, on arriving at a depth of 9ft, came upon what was considered to be the covering of an old drain, but which proved to be a remarkably fine specimen of an ancient stone coffin, containing the remains of a perfect skeleton (male). The lid of the coffin, which was of a cruciform shape was destroyed before the discovery was really made, and, strange to say, where clerks of works are appointed, the bones of the skeleton were thrown out of the cutting and allowed to be carried off by the populace. there is no inscription upon the coffin, which is 6ft 6in extreme length, 1ft 10in wide, and 14 1/2in in depth inside, and 18 1/2in outside. its weight is about 22cwt, and it is now in possession of the Greenwich District Board of Works, the contract entered into for the sewer works vesting all relics found in the ground opened in that body. The position in which the interment was made was placing the coffin in a line east and west, the head of the corpse being placed to the eastward. During the day the coffin was inspected by several residents of the neighbourhood. I believe this is the coffin that is currently located outside St Paul's churchyard.